He was an expert at bamboozling England’s batsmen, but now Shane Warne is set to leave viewers flummoxed in a new TV advert. The spin legend spent hours in make-up to appear as a baby and also as his own mum and dad. Do leave a comment if you’ve seen it or, better, have a link to it. 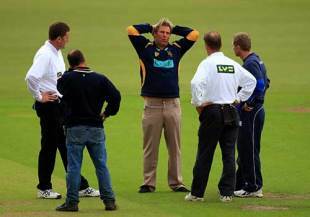 Robert “Crash” Craddock writes about Shane Warne’s list, and about Warne’s animosity towards Steve Waugh and Adam Gilchrist. But underneath it all there is a fascinating, essentially untold story about how two superstars of the modern game somehow managed to survive and thrive year after year in the same side despite a fallout which left each man cold. Waugh will never expand on the details because he could not be bothered starting a bushfire from which no one could win. Warne’s definition of Gilchrist as “still a batsman-keeper rather than the other way around” is not flattering (even given Gilchrist’s freakish batting skills) and one which Gilchrist would not enjoy. You can call Gilchrist a madhouse slogger and he will laugh along with you but dismissiveness of his keeping skills hurts him because he sees himself as a keeper first. …..In a perverse sort of way, Warne’s modest rating of Steve Waugh and Gilchrist gives us a hint of why Australian teams have been so successful over the past decade â€“ they simply put the personal stuff to one side and go out and play for the team. It sounds easy to do but it has been beyond many fragmented England, West Indian, Indian and Pakistan teams of the same era. Warne and Waugh might not have been each other’s cup of tea but you would never have known it on the field. The ability of Australia’s players to put their personal stuff to one side and play for the team is undoubtedly a big part of Australia’s success. I don’t know, but I suspect that New Zealand are also good at doing this, which is why they are able to punch above their weight in international cricket. I see Kevin Pietersen has been knocked off the top spot in the ODIs by Ricky Ponting. Very difficult to argue with that â€“ Ponting is surely the stand out batsman in both forms of the game. Looking at the other batting rankings, it is difficult to find fault, although on current form, Shiv Chanderpaul ought to be in the test top three at least. Also, I struggle to understand how Mahela Jayawardene doesnâ€™t break into either top ten, while Hussey retains a top five place in both. Heâ€™s very good, granted, but is he top five? The bowlers are altogether more perplexing. For one, how can Shoaib Akhtar still be at number 10 in tests? Heâ€™s played four tests since the start of 2006 and taken only a handful of wickets. Maybe in the current game, not playing is the way to climb the rankings. Likewise, Jason Gillespie (22) is still deemed a better Test bowler than Lasith Malinga (28)! Agreed, it must be difficult to devise a workable system. Also, stats donâ€™t tell the full story. But things start to look decidedly suspect when you inspect the Best Ever Ratings, which is a list of players at their peak. Ponting at four is just about fair enough, given his recent dominance. However, Peter May above Viv Richards shows a flaw, while Matthew Hayden in the top ten is just crazy. KP (21) is one place higher than Sachin and two places higher than Wally Hammond. Enough said. For the bowlers, I half expected to see the list packed high with bowlers of yesteryear, given how modern bowlers are meant to have struggled, but it does put Murali, McGrath, Pollock, Waqar and Warne in the top 15. Of course, Warne should be in the top three, if not top of the pile. Wasim Akram limps in at number 57 behind the likes of Ntini, Shoaib and Harmison, which doesnâ€™t seem right. That said, like most critics, I canâ€™t think of a better way. There must be some bright spark at Cricinfo with a formulaâ€¦.? Michael Parkinson, the renowned television interviewer, will talk with Shane Warne this Monday at 7.30pm on Australia’s UK TV. If anyone watches it, do leave a comment afterwards for those of us who won’t be able to see it.